Dinosaurs were wiped out by an asteroid impact when they were at their most vulnerable, according to a new study. Dr Steve Brusatte, of Edinburgh University, said sea level rises and volcanic activity had made many species more susceptible to extinction. 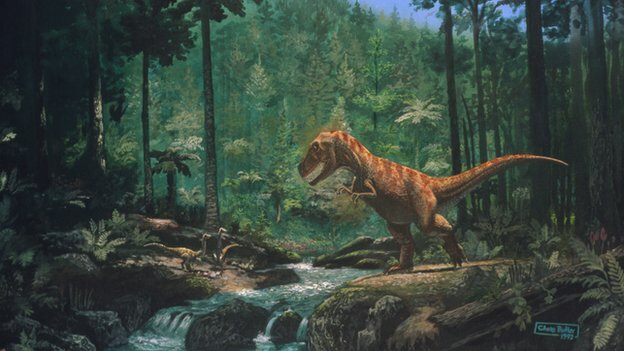 "It was a perfect storm of events that occurred when dinosaurs were at their most vulnerable," Dr Brusatte told BBC News. Bad luck for the dinosaurs but good luck for us. I can't remember for certain but I think Hugo de Garis said something along the lines of, "Imagine if you were an alien visitor watching the asteroid that would destroy the dinosaurs heading toward earth. You know you could stop it, but then these funny little rodent like creatures (that evolve into humans) scurrying about at their feet never get a chance. Do you stop the asteroid?" His point being that the future intelligences that evolve from the events that will unfold over the next several millenia may well feel the same way (about a human extinction being the necessary precursor for an AI intelligence explosion). But technically.... they did. In the form of birds. Bad luck for the dinosaurs but good luck for us. Just read this article on BBC News. Very interesting, and indeed a very unlikely set of circumstances for wiping them out. Had those circumstances been just slightly different, humanity would probably never exist. Strange thought. If the dinosaurs hadn't gone extinct, how would they adapt to today's climate? I can see warm-blooded feathery dinosaurs trudging their way through the ice ages. Of course, we could have civilizations of sentient dinosaurs instead. Repeat: Birds. Birds are dinosaurs. And I don't think dinosaurs will be sentient. I mean, yes they're are smart and manipulative dinosaurs and with them alive, we will have no mammals to speak of. But still, it's so weird to think of a sentient dinosaur. That's too mind blowing lol. i agree with asian_guy, imagine earth has produced so many wonderful creatures in different epoch and era, yet in all those billions of years, not one creature before us has ever had our kind of intelligence. the ones who were were closely related to us. just think about that: the kind of intelligence that humans/neanderthals/homo erectus and the like had is very very rare. we were the only creatures that had ever learned to create sophisticated tools. Appendages capable of bulding large varieties of objects+ intelligent enough brain +plus expansive communication= recipe for a future sentient civilisation, mammal or not. By the late cretaceous, many species(especially the raptors) had almost developed the former 2, we don't know about the 3rd. I believe that if dinosaurs hadn't gone extinct there would've possibly been a sentient species in another 15-20 million years. Might as well think of a sentient bird. And earth could easily be the homeworld to a Type III Civilization. 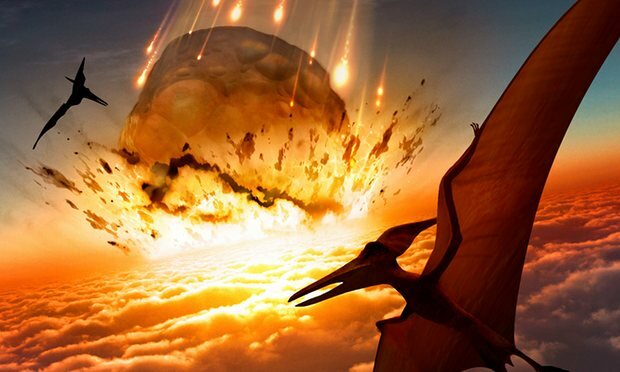 Volcano, Asteroid or Both, What Killed the Dinosaurs? Extinction Mystery Solved? Did a giant volcanic eruption in India help a meteorite kill off the dinosaurs? Recent study suggests that It wasn't just an asteroid, they caused extinction together. The asteroid that slammed into Earth and heralded the doom of the dinosaurs triggered a surge in volcanic eruptions that made the catastrophe even worse, researchers claim. Scientists analysed prehistoric lava flows in India and found that soon after the massive impact, volcanic eruptions became twice as intense, throwing out a deadly cocktail of sulphur dioxide and carbon dioxide. The shockwaves produced when the space rock thumped into Earth likely shook up volcanic plumbing systems around the world, creating larger magma chambers that spewed out more material when they erupted. Combined with the hefty impact, the increase in volcanic activity would have pumped enough dust and noxious fumes into the atmosphere to blanket the Earth and drive many species to extinction. The dinosaurs’ long reign was not ended swiftly but by torturous millennia of climate change before and after a giant asteroid slammed into Earth, scientists have said. 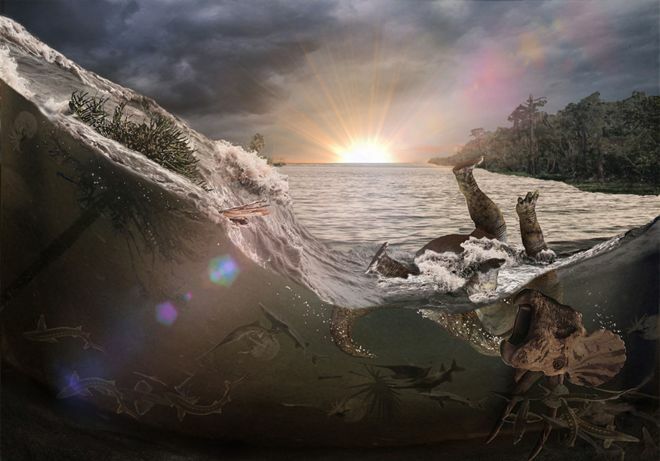 The impact at Chicxulub in modern-day Mexico certainly contributed to the disappearance of the dinosaurs, but was by no means the sole cause, a team concluded in a study published in Nature Communications. Ten of the 24 species which disappeared at one Antarctic island did so long before the comet or an asteroid hit the planet some 66m years ago. The other 14 disappeared in a second extinction wave that started with the impact contributing to the second-biggest mass extinction in history. Nearly half of life on Earth, including all non-avian dinosaurs, were wiped out. The dinosaurs’ demise, according to US-based researchers in the new paper, was caused by two periods of global warming – the first sparked by monster volcanic eruptions in what is India today, and the second by the asteroid’s impact. 66 million years ago, the sudden extinction of the dinosaurs started the ascent of the mammals, ultimately resulting in humankind's reign on Earth. Climate scientists now reconstructed how tiny droplets of sulfuric acid formed high up in the air after the well-known impact of a large asteroid and blocking the sunlight for several years, had a profound influence on life on Earth. Plants died, and death spread through the food web. Previous theories focused on the shorter-lived dust ejected by the impact. The new computer simulations show that the droplets resulted in long-lasting cooling, a likely contributor to the death of land-living dinosaurs. An additional kill mechanism might have been a vigorous mixing of the oceans, caused by the surface cooling, severely disturbing marine ecosystems. Some 66 million years ago, a city-sized asteroid set fire to the planet and began what was likely the worst day in history. Decades of research have helped illuminate the actual impact. But scientists are still figuring out what happened over the years that followed. Based on studies of the impact site, it’s likely that sulfur vaporized from the crater would have choked our atmosphere and blocked the sun for years or decades. So Earth likely cooled into a kind of nuclear winter, with land temps plummeting as much as 28 degrees Celsius (50 degrees Fahrenheit). And after that debris settled, the lingering carbon dioxide probably pushed our planet into an epic period of global warming. But most of the specifics — like just how hot is hellish? — have come from models rather than the rock record. Now, a study published Friday in the journal Science attempts to change that. By examining many millennia worth of tiny fossils, the researchers estimate that Earth’s global average temps rose by a whopping 5 degrees Celsius (9 degrees Fahrenheit) after the impact and stayed at that level for some 100,000 years.